Last week at the Emerging Communications Conference (eComm) 2009 in San Francisco, a remarkable event happened: Jonathan Zar, Martyn Davies, and I (Dan York) all wound up at the same place at the same time. Over the 3.5 years since we started Blue Box back in October 2005, Jonathan and I have met at events, Martyn and I have met and Jonathan and Martyn have met. But the three of us had never been together at the same place. Alas, it was too noisy there for us to do any actual recording, but it was great to have all three of us there. For those who may not recall the history, Martyn was one of our earliest listeners and is the person who provided both the image that we use for Blue Box (in iTunes, in the MP3 file, etc.) and also the music that we use for the intro and outro. He's also guest-hosted several times and contributed a couple of interviews over the years. 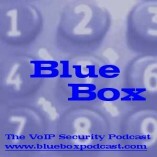 Welcome to Blue Box: The VoIP Security Podcast #81, a 42-minute podcast from Dan York and Jonathan Zar covering VoIP security news, comments and opinions. Download the show here (MP3, 19MB) or subscribe to the RSS feed to download the show automatically. NOTE: This show was originally recorded on May 21, 2008. Voice of VOIPSA: Are your Skype username and password completely exposed if you use iSkoot?